Conducting a concept study is one of the first steps in developing a new design. A good concept study gives you insight in the feasibility, cost of goods, design alternatives and the required development time. With the chosen concept you can timely adapt the planning of the project. Sometimes the concept study can even lead to changes in the specifications. The reticle stage is one of the sub-systems in ASML’s wafer scanners and steppers. The reticle stage positions the reticle with its integrated circuit (IC) patterns during wafer exposure. The transition from static to scanning exposure required the development of a reticle stage to replace the reticle table. A concept design study, as well as mechanical and system analyses, was conducted for this new module. This resulted in design and external interface specifications. The wafer stage is one of the sub-systems in ASML’s wafer scanners and steppers. A wafer stage positions the wafer while integrated circuits (ICs) are being exposed. 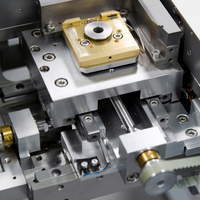 Specifications were drafted for the redesign of the X-axis in this six-axis stage to allow even higher speeds and accelerations. This included both internal design and external interface specifications. Preliminary studies involved conducting a concept study into the profile, implementation and choice of material for the guide rail. Specifications were also drafted for the air bearings and direction was given for continued design.